This shape of nail is very either you love it or hate it. I am of the opinion they can look good but are incredibly impracticable, and therefore are best for artistic purposes. Nail art is after all an art and each nail is a mini canvas for you to work your talent on. 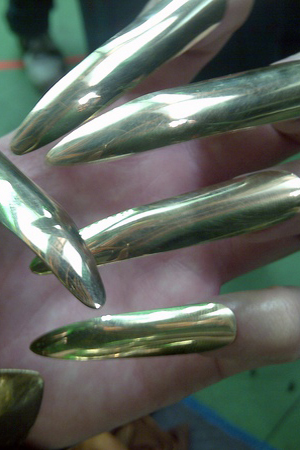 This particular product is nail tips shaped in a pointy / stiletto heel style, and I got them from BuyInCoins.com. As usual they arrived within two weeks, packaged really well and the different size nails were individually packaged up inside so it is easier to select the right size nail. The quality of the nails isn't 100% however for £1.39 I think they are well worth it. They aren't soft enough to flop, and aren't too hard so you can't cut them and trim them down in to a much more wearable stiletto length. If you were looking for a cheap stiletto nail tip then I do recommend these ones. Both Rihanna and Beyonce have their nails at a more wearable length. Imagine doing the dishes with the nails Katy Perry wore, below! These nails were a trend during 2011 for celebs such as Rihanna, Beyonce, Gaga and Jessie J. I am not one for following fashion and trends however I think at a shorter length this shape nail can be practical and look good too. Any longer than these Gaga ones and I doubt I could type! What do you think of this shape of nail? I have done another blog post featuring the stiletto shaped nails if you want to see that click here.